Is it in your bucket list to astound your guests in the next party you are hosting at home? Well, there is a new ice-making trend that can ideally melt slower than the regular cubed or crushed varieties. This is known as the ice ball - something that you can DIY with a customized ice mold tray. 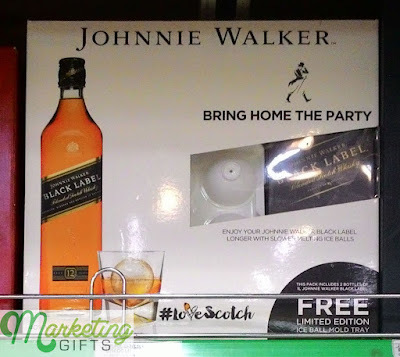 Johnnie Walker has taken the liberty to give it to consumers as a promo gift so that you'll get to understand why the circular ice is better. What brand benefits does the customized ice mold tray offer? Big Sales. Shoppers are attracted to promotional merchandise that they have seen for the first time ever. Apart from thinking of how interesting it is, they probably also ask themselves when will be the next opportunity they can witness that kind of ice tray. Due to the latter, the customers can most likely not help but grab the GWP from the shelf. Brand Activation. You can freeze any type of liquid inside the in-pack promotion. Since it comes with the Scotch whiskey, they may consider creating ice out of the liquor instead of water. Your brand name will gain great reviews in case these people start handing this out to their friends who can turn into your new consumers. Extended Advertisement. Offering durable freebies is the way to market a brand. The gift with purchase can endure a lot of ice-making sessions. Thus, even when the #LoveScotch campaign is over, you may keep on making as many ice ball as you want. Can't see your business's future with your current advertising ideas? See further choices at the Marketing Gifts blog. Nice information. Corporate gift help clients to associate brand image, loyalty to clients, and can often attract new customers. Find Unique Corporate Gifts in Australia at Revolutionaustralia.com.